The North American Anglo-Arabian Horse Association (NAAAHA) will again be honoring Anglo-Arabian horses competing at Youth Nationals and Sport Horse Nationals in 2010. The top winning Anglos in all classes at each show will be awarded an embroidered cooler and neck ribbon, with a gold trophy also going to the Supreme Champions. NAAAHA is again conducting their High Point Award Program for Anglo-Arabians that compete in Working Hunter, Jumper, Eventing., Dressage, Sport Horse, Conformation, Endurance and Competitive Trail. All shows/rides whether rated or unrated will count towards these awards. Points are retroactive from 12/1/09. Details are posted on the website. Membership is required to participate. Sponsorships of these awards are available and are tax-deductible, as NAAAHA is a 501(c)(3) non-profit organization. Current sponsors include Anglo-Arabians.com, Miranda Kuchera, Starstruck Farms, Greenbriar Farm, Herbst Farms and Bayview Farm. Anglo-Arabians are the third oldest breed in the world, having been bred in France as far back as the early 1800's. The breed is comprised of a combination of Thoroughbred and Arabian blood, requiring no more than 75% Thoroughbred and no less than 25% Arabian to be registered. Anglo-Arabians are highly respected worldwide as exceptional athletes, especially in the Olympic disciplines, and are ranked third in the world in the sport of eventing. You can visit NAAAHA's website, www.NAAAHA.com for more information, or call (410) 823-5579. Kelly Carper Polden, a local resident, equestrian, author and communications consultant, and her Arabian horse CC Hershey Bar, reached a milestone in the American Endurance Riders Conference (AERC, www.aerc.org) by successfully completing five 50-mile endurance races in the past 12 months. Kelly and Hershey were awarded with their 250-mile AERC patches in April. "I am so proud of Hershey," Kelly said. "He is only six years old and is already proving his incredible strength and endurance. Hershey is a ‘Badlands-raised endurance horse’ from the Cedar Coulee Ranch in North Dakota. His sire, Derby Whirl, is now a premiere stallion in Switzerland. Hershey is taking after his sire in strength and musculature. Our fastest 50-mile time to date is five hours 17 minutes and 32 seconds — and I haven’t even let turn on full power yet! Hershey has so much potential and I look forward to many hundreds of miles of riding with my equine partner." Kelly and her husband Howard Polden are on the ride management team, along with Ride Manager Scott Godwin of Dripping Springs, for the first endurance event in this area. The Old Glory Endurance Event is scheduled Memorial Weekend, May 29-30 at the historic Storm Ranch near Dripping Springs. The event includes 25-mile and 50-mile endurance races on Saturday and Sunday, as well as a 15-mile introductory ride each day for those who want to enjoy the ranch and get a taste of what endurance riding is all about. For more information check out the website at http://www.godwinarchitectural.com/old_glory_2010-2.htm. In addition to being an endurance rider, Kelly is an author. She recently signed a contract with Arcadia Publishing, the leading local history publisher in the United States, to author a book entitled Lyndon B. Johnson National Historical Park. The book is scheduled for release in December 2010 and will commemorate the 2011 grand opening of the Texas White House at LBJ Ranch. The Las Vegas Film Festival will present the documentary "Arabian Silk: Horses of Endurance" with the Golden Ace Award on Sunday, June 6th 2010. Christine Lazzarini, Producer, will be at the Closing Night Awards Ceremony to accept the award. Festival judges issued this statement: "Our judges felt that your film demonstrated superior and standout filmmaking and is deserving of special recognition." deep, touching friendship as they go through trial and triumph. During the three months Galapago Amigo was treated for a devastating injury at the University of Tennessee’s College of Veterinary Medicine, he made nearly 8,900 Facebook fans, gained more than 100 pounds and accrued veterinary bills of more than $30,000. That's the largest tally for one animal's care on record, clinic staff acknowledges; but thanks to friends and donors, Amigo's owner won't have to foot the bill. "Amigo wouldn't be alive without the support of so many," said Amigo's owner Gary Sanderson. "He's coming home to my house, but he has 8,900 owners." Amigo left the Large Animal Clinic on Sunday to return to his 110-acre farm in Union County after a celebration marking his progress since Jan. 17. That's when the chestnut endurance Arabian was impaled by a tree limb. Amigo arrived at the clinic, the branch still in his chest cavity, and was given a 2 percent chance to live. "He's made a miraculous recovery," Sanderson said. "I didn't think he was going to make it. The fact that he's coming home now is a blessing." Sanderson was an emotional wreck, he said, after finding the 2-inch-wide, 3-foot-long limb lodged into Amigo's left side. The horse, which competes and is ranked nationally with the American Endurance Riding Conference, had broken two ribs and was near death. The North American Young Riders Endurance Ride is scheduled for July 29, 2010. It is a FEI 2* 75 Mile ride for Young Riders. The event will take place at Shaker Village in Harrodsburg, Kentucky and is held in conjunction with the North American Junior Young Riders Championship at the Kentucky Horse Park - home of the 2010 World Equestrian Games. Hi! my name is Kathy Brunjes, and I live in Maine. I have been involved in the endurance discipline on the international level since 2000, and have competed in endurance since I was a teenager. I was part of the USA- East endurance squad at the 2001 PanAms (as a rider) and a competitor (and team member) for the endurance team at the 2002 World Equestrian Games (in Jerez, Spain), a rider for the USA-East endurance squad at the 2005 North American Edurance Challenge and rode for the USA at the 2007 World Endurance Championship Pre-ride (The Sultan's Cup) in Malaysia, the 2008 President's Cup in Abu Dhabi, United Arab Emirates, and then was selected for the 2008 World Endurance Championships (Malaysia), riding as one of the four-member team. Theatric, the horse that I rode in Malaysia in 2007, Abu Dhabi in 2008, and Malaysia in 2008 will be my nominated horse for the 2010 WEG. Theatric is a 16h. chestnut Arabian gelding, with much international experience. Last week a great friend to endurance riders, Jeff Briscoe, passed away. There will be a graveside service in the Bakersfield National Cemetery on Tuesday, April 13 at 9:30 a.m.. For directions, www.cem.va.gov/cems/nchp/bakersfield.asp. Jeff rode endurance in the late 70s, then spent many years shoeing horses, building barns, and helping all of us with our equipment, trips and projects. Amigo is coming home - and a party is planned! Nearly 8500 Facebook fans of endurance horse Amigo have been invited to a party to mark his return home. Given that fans of the horse, who has made a miracle recovery from an impaling injury, are spread around the world, it is unlikely the large animal clinic at the University of Tennessee will be swamped with visitors. However, Amigo has enjoyed a steady stream of visitors over the many weeks he has been recovering at the clinic. 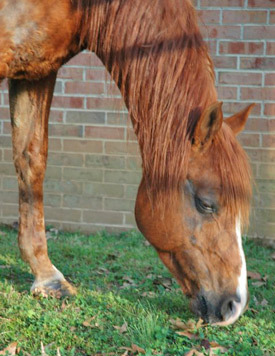 Amigo was given only a 2 per cent chance of survival after being impaled on a branch in his pasture at Luttrell. The branch penetrated his chest cavity and snapped two ribs. The Arabian horse has overcome a string of life-threatening hurdles to be well enough to go home. label Velcro'd on that says "Emergency info. inside helmet"
husband's name, where he worked, were she lived, etc. laminated. The print is *very* small. body parts.... "Does this hurt?" Happy Trails and STAY SAFE!!! keep the burs from under your saddle, spur yourself onto greatness. I fly to San Francisco and drive to Fort Bragg for a blind date with my northern Californian travelling companion. A spunky 14-year-old with golden blonde hair, my new friend is named Citron. She's an endurance race horse, a palomino mare, half-Arabian and half-Akhal Teke, an obscure but smooth-gaited breed from Turkmenistan. The Arab world has been breeding endurance horses for centuries; in the United States, however, the equine ultra-marathon was introduced in 1955 by Wendell Robie, a Californian businessman who wondered whether horses no longer used for transportation could match the feats of their Old West counterparts. He founded a 100 miles-in-one-day race, now the annual Tevis Cup, on a mountainous 19th-century Pony Express trail between Lake Tahoe and California’s former capital, Auburn. Today endurance races consisting of 25- to 100-mile courses over natural landscape take place in Europe, the Middle East and Australia. Not surprisingly, the sport favours pureblood Arabians, desert horses bred for stamina. A casual rider since childhood, I've signed up for a September week of endurance training in Mendocino County, whose terrain includes redwood forests, cattle flats and miles of undeveloped beach. My host is Lari Shea, who won the 1989 Tevis Cup on a pureblood Arabian stallion and has since competed with various crosses, including the offspring of Arabians and Russian Orlovs, a trotting breed introduced to the United States during the Cold War. Dubuque Senior High student and 3 other area riders travel to the Middle East to race horses. 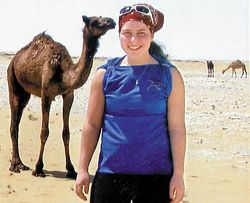 McKinzie Flanagan felt queasy as she sat on the sheik's horse and stared at the open desert. In a matter of moments, the Dubuque Senior High School student would become one of the few Americans to race in the H.H. Emir Endurance Cup at the Qatar Endurance Village in Mesaieed, Qatar. "I travel for endurance (races) a lot, but I've never been that far away from home," Flanagan said. She was one of four Dubuque-area riders who raced Arabian horses owned by Sheik Mohammed Bin Hamad Bin Khalifa Al Thani in the March endurance race, a 65-mile trek in the desert. The sheik's horses were treated like royalty. In a castle-like barn, they had a sauna, spa, treadmill and pool. "We wouldn't mind being horses over there," Flanagan said. The second Annual Right Lead Endurance Ride will be held on May 22, 2010 at the Bucksnort Camp Grounds in The Natchez Trace State Park. Last year’s ride was a success and we would like to thank all the diehard riders and workers who weathered all the rain and mud to help make the ride a success. We are also very happy to have made a sizeable donation to the Equine Rescue & Protection Humane Society of the U.S. in Clarksville, TN. You can visit their website at www.equinerescueprotection.com to see what they are doing to help our fellow equines in need. We hope to have another successful ride this year with the help of all our great sponsors and all those who participated and helped out last year. For more information on Endurance riding, or to download an entry form, please visit www.aerc.org. An important rule change affecting the use of non-steroidal anti-inflammatory drugs (NSAIDs) in U.S. Equestrian Federation (USEF) competition horses goes into effect April 1. The USEF Board of Directors voted to amend its Therapeutic Drug Rule and restrict use to a single NSAID beginning December 1, 2011. While the presence of two of the seven approved and quantitatively restricted NSAIDs in a horse will still be allowed prior to December 2011 (with the exception of the forbidden combination of phenylbutazone and flunixin meglumine, trade name "Banamine"), it is important to note that new restrictions are in place concerning their use. Beginning April, 1, 2010, anyone administering two NSAIDs to a horse within five days prior to participating at a USEF-licensed competition will be required to complete and file a NSAID Disclosure Form with the USEF Steward/Technical Delegate or their Designated Competition Office Representative. This form will allow the USEF Equine Drugs and Medications Program to collect valuable data regarding the use of NSAIDs in competition horses. USEF has developed an education plan to guide management, owners, trainers, and exhibitors through the implementation of this rule change, including an informational pamphlet and NSAID Disclosure Form. Both the pamphlet and the forms will be shipped to all competition managers for distribution from their competition offices. It is the responsibility of the competitor and their veterinarian to make certain the use of two NSAIDs within five days of competing is reported on the NSAID Disclosure Form and is properly filed with the USEF steward/technical delegate or their designated competition office representative. It is important to note that a standard USEF Medication Report Form may not be used in this particular instance.